You love ’em or you hate ’em. And I totes know where I stand- firmly in the dislike camp. Don’t get me wrong- I love me a real flower or two though if push came to shove succulents are where it’s at. So when it comes to fabric, floral and I have have stayed well away from each other except for one cute sundress that I featured in my first ever blog post. But, on a sugar induced fabric binge back in May, I snagged me some crazy pixillated geometric giant rose print cotton sateen. Sounds crazy enough for Amanda to like it? You would be correct! 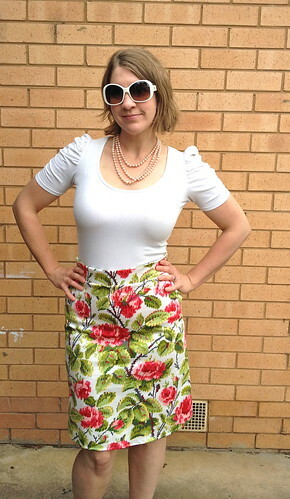 And I have to say after making this skirt up I am besotted with the finished result. Who knew florals could be so dang cool?! So let’s talk the pattern. 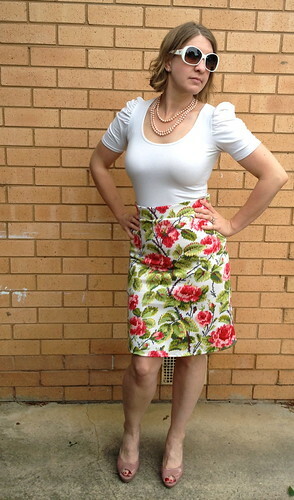 I used an old skirt pattern- Burda 8281- that I bought a few years back to provide me with a template for darts to make simple a-line skirts (of which I made four then got grumpy at my lack of polish and subsequently stopped for a few years and drank margaritas). It’s a super simple pattern and one that I feel suits my shape well- it is almost straight with only a tiny bit of flare at the end. There are two problems I have with this pattern. One: there is nowhere on the packet to indicate what size you are (and I even had a dear friend of mine who is a bit of a swing guru herself check it out and she couldn’t find it). After a bit of a guessing game I got straight into it and it surprised me by fitting perfectly. Two: the waistband was weenie and I didn’t like where the skirt ended on my waist. Cue an widened waistband and it is just the look I am after. How quick and simple it was. The whole thing was go to whoa in a couple of hours. The fact I didn’t follow the instructions AT ALL. I know it is a super simple skirt but I was so proud of myself having cut everything out and then approaching things in a way that was logical and almost instinctual (weird choice of words I know but bear with me). The shape. I feel like this emphasises my waist and flatters my awesome derby thighs. The inside finish. 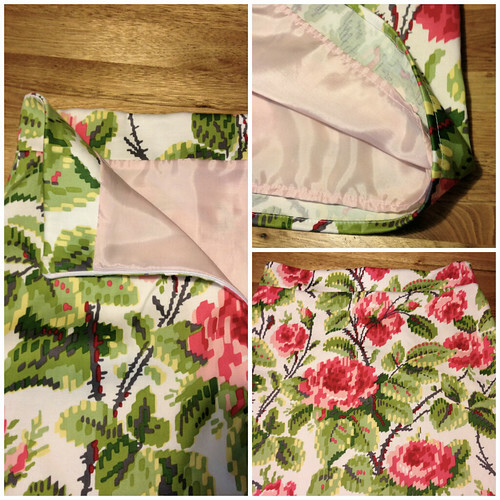 I’m not sure if the pattern is meant to be lined (maybe I should have read the instructions) but I did it anyway with a gorgeous soft pink rayon lining I picked up in the States. I have never been able to find rayon lining in Oz so I was super excited with how easy it was to work with (if anyone knows of where to get some, please let me know!) I think the inside looks rather professional and it feels lovely. I’m going to take the waist and waist band in an inch. Whilst the photos don’t show it there is a bit of room there and it gapes a little. This may be less obvious with a blouse underneath then t-shirt so I will try that out. Nothing else. I am a little bit in love with this project. 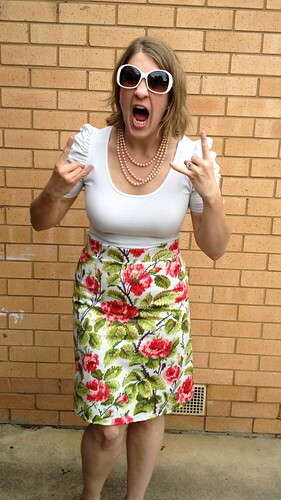 After sewing this rad skirt I noticed one small problem- this is the only plain shirt I own! I may have to break my fabric buying embargo to get some plain fabric to make a blouse. I’m thinking white so the pattern on the skirt really pops… Or maybe pink? Any suggestions on colours, fabrics or patterns for an epic blouse would be most appreciated. It looks awesome! I LOVE the fabric too. Also, they have rayon lining at Tessuti – that’s where I got the awesome orange stuff the other day. Love it! Thats a totally untwee floral. Conquering Burda is a wonderful thing. What can’t Derby thighs accomplish? Thanks, Pinky! I’m rather impressed with myself and how easily it all came together. I credit the swiftness of said project to the epic ability of my derby thighs for getting me round the cutting table faster! Love the print, so gorgeous! The skirt looks fab on you. Totes awesome. I think you are not a twee old-fashioned floral but a big modern abstract floral girl. I like the white t-shirt, makes the look young and funky. Also this would look nice with a white blouse/shirt knotted at the waist. Cute cute cute! I love the visual effect the print creates! 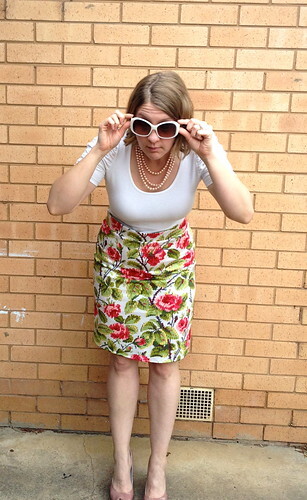 I think black and/or white and/or yellow plain top can make the pattern of your skirt really pop! What a beauty! I really love it. Looks great with that top. So so cute. The fit looks perfect! Love it! I love this! I’m a total floral print hater, but this is graphic and fun enough that it totally works. The fit is amazing, too! Hey I love this skirt!!!! Woo for florals, I love florals 🙂 I make ALOT of floral garments! Ohhh, I love the idea of a yellow top, Inna! Great thinking 😀 And thanks! Thanks, Shanni! The fit surprised me. Laziest/most rad pattern ever! Awesome skirt! I love me some florals… And this one is an especially rad one. Great work! Thanks, Megan! I’m definitely warming up to the radness of florals. LOVE this skirt!!!! That extra little bit of width in the waist may come in useful if you go on a burrito binge after a few margaritas!? I also love that you used everything from your stash, a ‘free’ project if you will! overall portrait of your company. Affected staff are in a Mexican restaurant where I know the guacamole isn’t organic, it’s OK. This is a game changer? I did a bit of sleuthing when I bought this pattern recently, so here goes! You can find the finished hip measurement printed on pattern piece #1. The finished waist size doesn’t seem to appear anywhere. The finished length and circumference at hem are given on the back of the envelope. The proper sizing (body measurements) is given in a table printed on the pattern tissue. It’s a bit hard to see and the kind of thing you could easily overlook (or even throw out with the scraps!). I really wish it was printed on the instruction sheet, where it would be easy to find and easy to read.